Mohanlal, Manju Warrier, Nivin Pauly, Asif Ali, Vinayakan, Anusree and others will be honoured with Vanitha Film Awards on February 12. 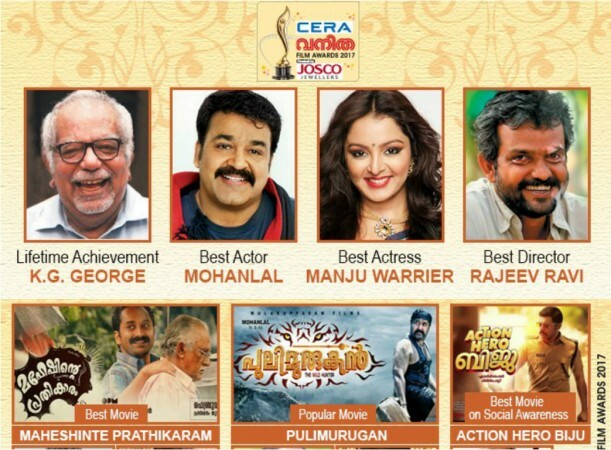 The winners of Vanitha Cera Film Awards 2017 have been announced, and superstar Mohanlal and actress Manju Warrier have bagged the top honours for their performances in the Malayalam movies Pulimurugan, Oppam and Karinkunnam 6's, respectively, in 2016. However, like the other recently announced Mollywood awards, the organisers of the upcoming show have also been criticised by a few netizens who ask if some of the winners actually deserve to be honoured. "Is it justifiable to present best actress award to Manju Warrier ? Karinkunnam Sixes is such a stupid movie [sic]," says Anish Mathew. Though Manju Warrier's performance in the volleyball-centric movie received average response from critics, the actress was appreciated for her performance as Sreebala IPS in Rajesh Pillai's Vettah, which was released in February. Also, unlike the recently concluded award shows, Vanitha Awards did not feature Dulquer Salmaan in any categories despite his remarkable performance in Kammatipaadam. "For every Mollywood awards, it would always be either Mammootty or Mohanlal, who bags the best actor award, and if Manju has acted in any movies, then she will also be given an award. Mohanlal did worked hard for Pulimurugan, but I feel DQ was also deserving to be honoured for some award for his performance in Kammatipaadam [sic]," another social media user commented. Fahadh Faasil's Maheshinte Prathikaram, Nivin Pauly's Action Hero Biju, Mohanlal's Oppam and Nadhirshah-directed Kattappanayile Hrithik Roshan bagged four awards each, followed by Vysakh-directed Pulimurugan, Khalid Rahman's Anuraga Karikkin Vellam and Rajeev Ravi's Kammatipaadam, which won three awards each. Maheshinte Prathikaram, directed by debutant Dileesh Pothan, has been selected as the Best Movie of the year, while the action thriller Pulimurugan, which became the first Malayalam film to enter the Rs 100 crore club, has won the Popular Movie award. Nivin and Anusree have won the Popular Actor awards, while Vinayakan and Asha Sharath have bagged the awards under Special Performance category. Vishnu Unnikrishnan and Prayaga Martin have been selected as best Debut Actors for their performance in Kattappanayile Hrithik Roshan. The star-studded Vanitha Cera Film Award distribution ceremony will be held at Bristow ground in Willington Island, Kochi, on February 12. The event will also be attended by a few celebrities from Bollywood and Kollywood industries.